Description: The Bush Bar Bracelet is a very easy Macrame project suitable for beginners and kids. 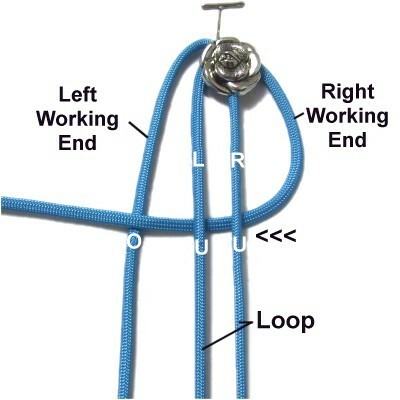 The knots can be arranged in two ways, with an open weave as shown above, or with a close weave as shown in preparation. 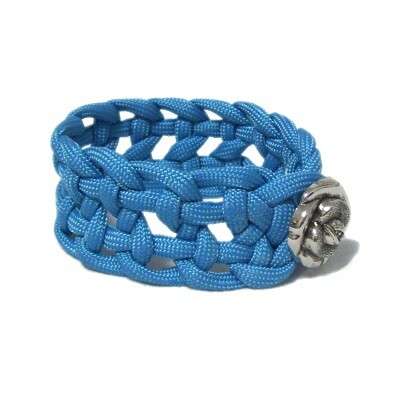 550 size Paracord was used to make the Macrame bracelet shown, but you can use just about any type of material. 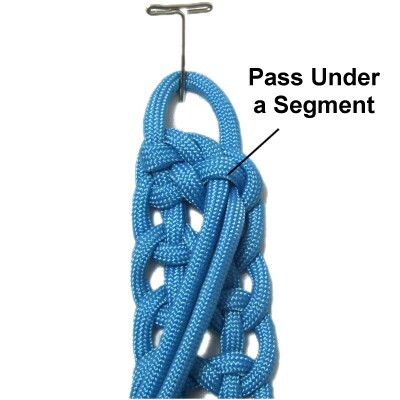 Please read the bottom section of Cord Preparation if you plan to use Paracord. It tells you how to prepare it for knotting. You need one cord 65 inches long for a bracelet up to 6 inches, if you plan to make the open weave shown at the top of the page. For other sizes, the cord should be at least 10 x the finished length you plan to make. 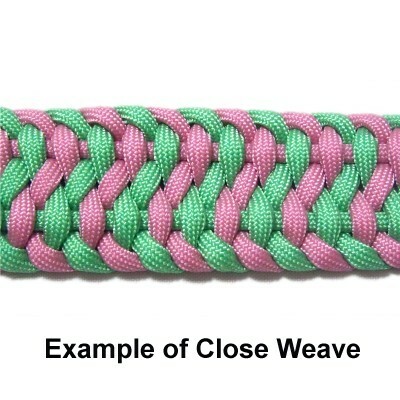 This is an example of a close weave made with the Bush Bar. 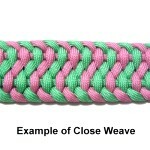 The cord should be at least 15 x the finished length you plan to make, if you prefer a close weave. Step 1: Slide the button onto the cord, then fold the cord in half at the center. The button should rest at the fold for now. Make a large loop, crossing right over left. Secure the crossing point. Adjust the loop until it's the finished length you want to make the Bush Bar Bracelet. Measure from the crossing point to the center fold. Slide the button to the crossed area at the top. Keep the pin in place for now. Secure the center fold, pulling the loop so there is tension. Mentally label the working ends where they are currently resting, left or right. Step 2: Curve the right working end to the left, passing under the loop and over the left working end. It should be arranged horizontally (arrows). Mentally label the two sides of the loop left and right. 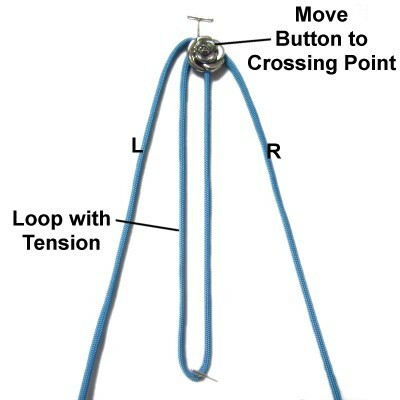 Step 3: Move the left working end to the right diagonally, passing it over the left side of the loop. Pass it under the right working end inside the loop, then over the right side of the loop. Pass it under the right working end where it curves. Pass the right working end under the left working end in the center and on the right. Pass it over both sides of the loop. 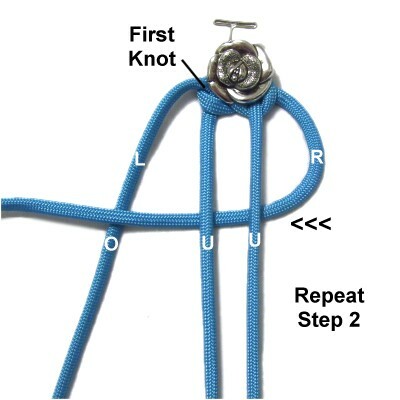 Step 4: Tighten the first knot firmly, so it's the same width as the button. Mentally re-label the working ends where they rest now. Step 4, continued: Repeat step 3. 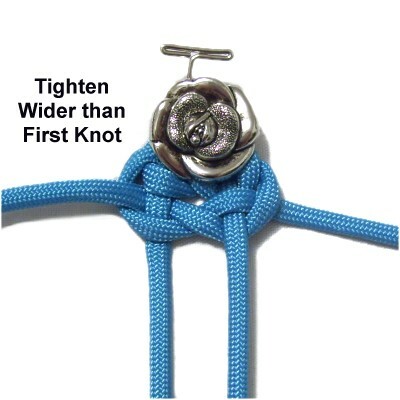 Tighten the second knot a bit more loosely than the first, so it's wider than the button. Step 5: Repeat steps 2 - 4 several times. Al the knots in the Bush Bar Bracelet shoud be tightened the same amount. 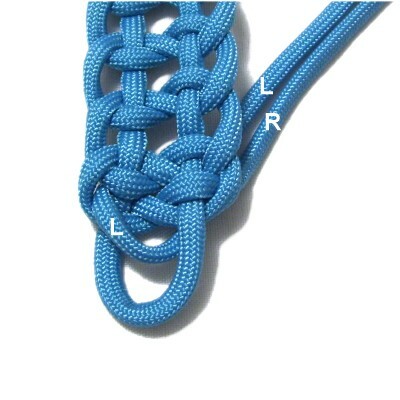 Important: Arrange the knots close together even if you have decided to make an open weave. 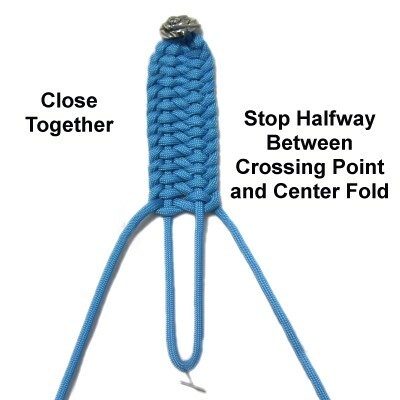 Step 5, continued: Stop when the last knot is halfway between the crossing point and the center fold, if you are making the open weave. Should you decide to keep the knots close together for your Bush Bar Bracelet (close weave), continue tying the knots until you are near the center fold. Make sure you leave enough space for the button to fit through the loop. 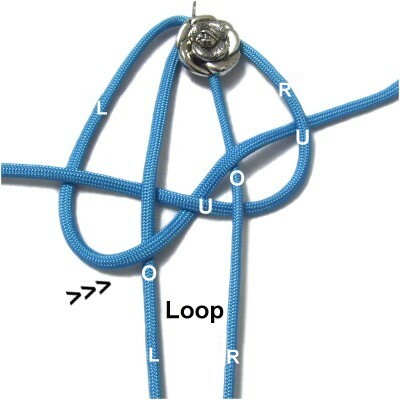 Step 6: Hold the folded area of the loop firmly. 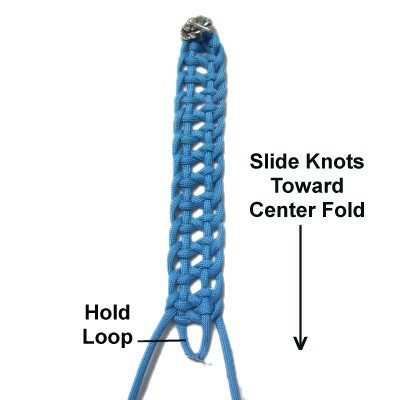 Slide the knots toward the center fold, separating them as much as possible (open weave). 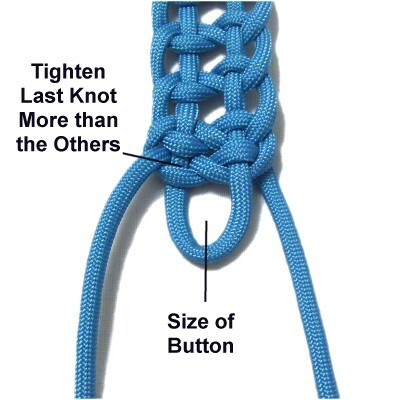 Designer's Tip: Don't be surprised if the knots are not evenly spaced. In that case, tighten some of the knots as needed, until the spacing is the same. Step 7: Verify that what's left of the loop is the same size as the button. Add or remove knots if necessary. 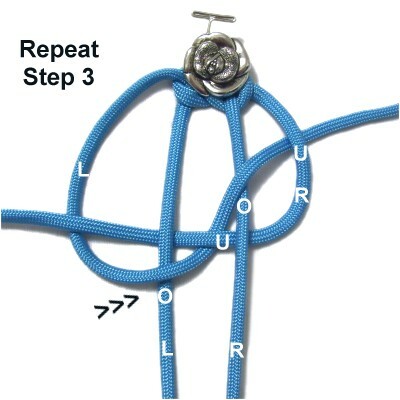 Tighten the last knot more than the others, and arrange it close to the previous one. 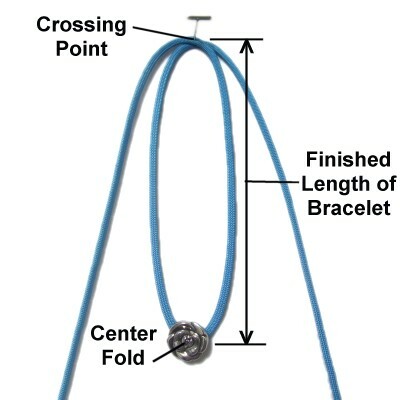 Step 8: Move the left working end through the loop toward the BACK of the Bush Bar Bracelet. Step 9: Make sure the bracelet fits, making any adjustments if necessary. Turn it upside down. Pass both ends under one segment. Apply glue under them and use a clip to hold them in place until it dries. Step 9, continued: Cut off the excess material close to the glue. Paracord needs to be finished by melting the tips, like you did in preparation. Have any comments about the Bush Bar Bracelet? Contact Me.